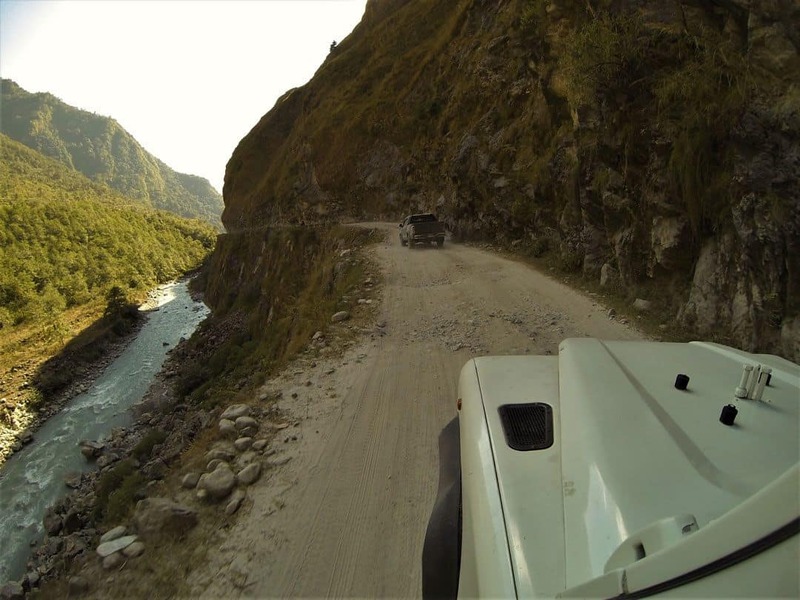 Just out of Jomsom we are faced with an unforgiving road to which we though would eventually even out…it didn’t. It’s the common first-time traveller who likes to get to the airport, take a photo of their passport while drinking an extremely overpriced beer, followed by a selfie with the plane before boarding…It’s days like these I wish I was the first-time traveller, with everything going according to plan. 24 hours earlier: Here we are at the end of our hike in the Upper Mustang, Nepal to the forbidden kingdom of Lo Manthang. Dad, David and I were very tired as we just completed 200 kilometres of high altitude trekking. We walked into Jomsom at 10am the day before our flight back to Pokhara and went straight to Tara Air to see if we could get out that day only to be told all flights were full, followed by a reasonably comforting, “Tara hasn’t cancelled any flight for the last 15 days”. Being stuck in Jomsom for a full day was, well, not very appealing. Our day in Jomsom included walking up and down the bustling, dusty streets, determining what the best method was for the pilots to fly us out the next day as we sat next to the runway watching Mount Nilgiri (7,064m), or counting the buses taking locals to Beni or Pokhara with a few thoughts on how good or bad the road would be. Soon followed by some window shopping, buying snacks and having an early lunch with beers, chips and chapatti to gets the imagination flowing. I guess feeding chickens Oreo’s is quite imaginative. 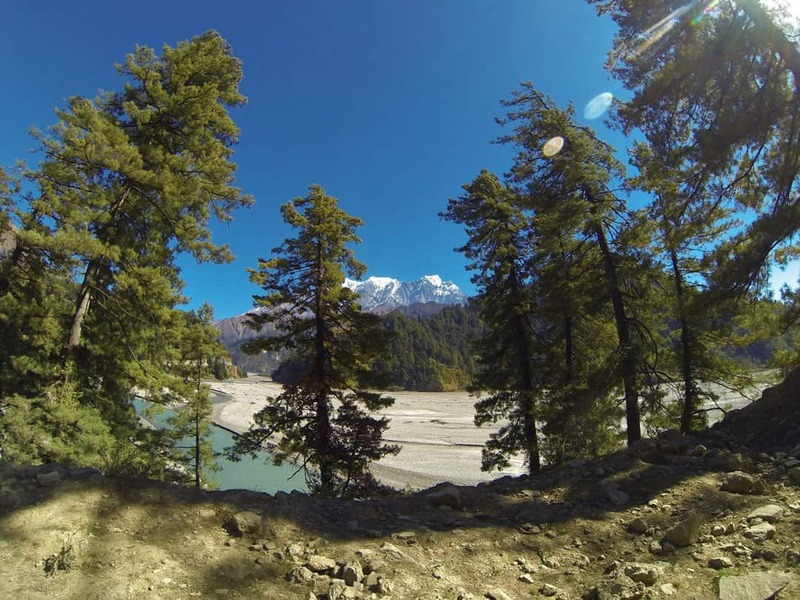 Nilgiri mountain through large pine trees. Also Kali Gandaki river is a river flowing from Tibet through Lo Manthang down to the Ganges and out to the Indian Ocean. 6am the next morning after basically zero sleep due a group of dogs continuously barked at who knows what, a gust of wind rattled the windows of our room, and straight away we knew that wasn’t ideal for us getting out of Jomsom on a plane. Down at breakfast, we called the owner of the hotel who made the impression that it was too windy to fly, but we thought the guy didn’t know what he was talking about. One hour after breakfast, it was a 2 minute walk down to the airport, which was packed full of eager passengers waiting for their flight out. One hour had passed and there was no communication at all from Tara Air or Simrik Air, and in walks Ivaan, the hotel owner with his aviation pass around his neck. 30 minutes on and still no communication or plane landing from Pokhara, we assumed they had cancelled due to the winds coming off the top of Dhaulagiri (7th highest mountain in the world). The small planes simply couldn’t get from Pokhara to Jomsom safely. 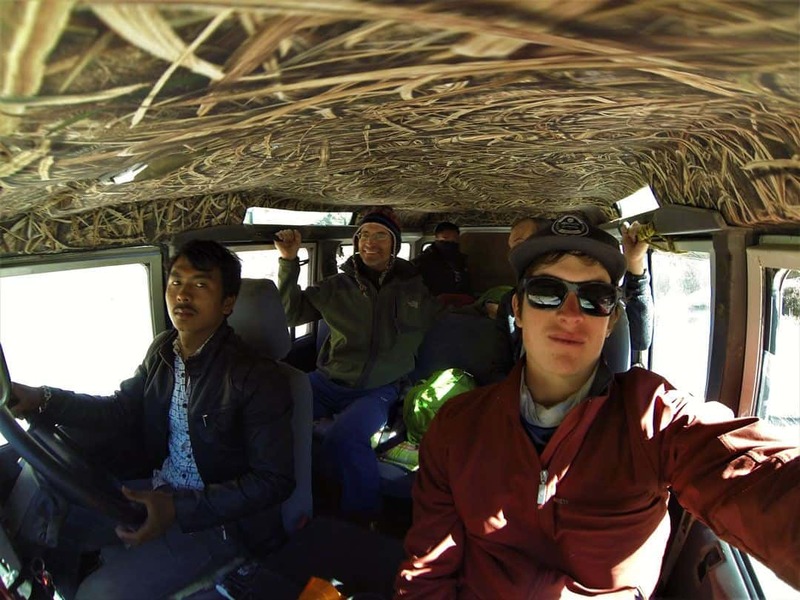 The rush had begun to get out of Jomsom and the only viable option was a taxi. Well, a 20-year-old Land Rover with no seat belts, no working dashboard, the tires had no grip, one of the doors wouldn’t close or some guy trying to get 26 people together to hire a bus at a better price, definitely was not an option. So $450 it was plus 9,000 rupees paid by a Nepalese couple for the very back seats of the Rover. Not cheap. The general drop off we endured for the 9hr trip. Our hiking bags slung into the back, our seats allocated on how much we paid, and we were away. Two kilometres down the road we were laughing at how bad the road was and had assumed it would flatten out and become more ‘drivable’. Dad’s door was sucking in dust so the driver pulled over, rustled through the centre console pulling out a bungie cord to which he wraps around the top of the door frame and the roof rack. Another 5 kilometres down the road our driver swapped cars with his friend and we couldn’t stop wondering if we had this guy for the rest of the trip until we stopped again, in the middle of the road on a corner and out goes our driver running down the road. From what we could gather, the other car in the fleet was having driving problems. Back comes our temporary driver, completes a U-turn next to a cliff and back we go to help out. Leaving our car hanging on the edge. Next thing we know, the other car has its drive shaft completely removed by the two drivers only to realise you can’t exactly move the car off the road after you remove the drive shaft. 45 minutes later we are off! Only to stop 15 minutes later so the driver and Nepalese couple can have lunch…As they were enjoying lunch, we were itching to get moving so the hour was spent watching our clocks and determining the speed of which the snow was being swept off Dhaulagiri which was flanking the tiny village. The hour had passed so back into the death trap on wheels, thankful that we hadn’t eaten lunch because we would have lost it by the time we got to the end of the tiny village. It was at this point I decided not to look at my watch. Getting some fresh air about 3 hours into the journey. And yes besides me in a massive cliff. Kilometres came slowly with close call after close call, mountain bikers would zoom past us as the sun would drop further down the sky behind us. 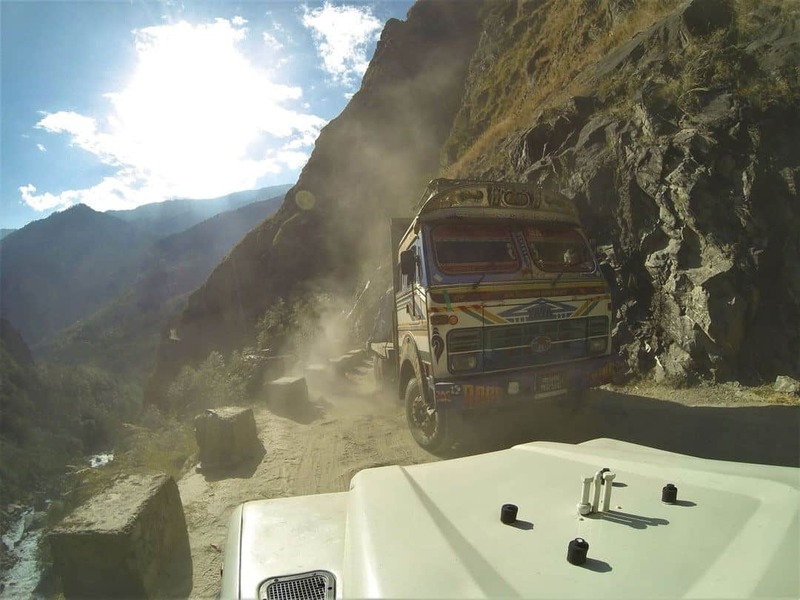 Three trucks, one bus and a petrol tanker passed us leaving the Rover precariously close to the endless gorge beside us. Light began to fade just like our smiles. Close calls continued with motorbikes, trucks and people walking down the middle of the road that has never be maintained. Our driver stopped at a towering waterfall asking if we wanted to take pictures instead. Being not very interested I took photos of people taking photos. Along the way, towering waterfalls from nearby glaciers allowed for pleasant viewing. Beni slowly came to light, haze filled the air from a burning rubbish tip, forcing Dad and I to put on our face masks, and it was at this point the novelty was well and truly gone. 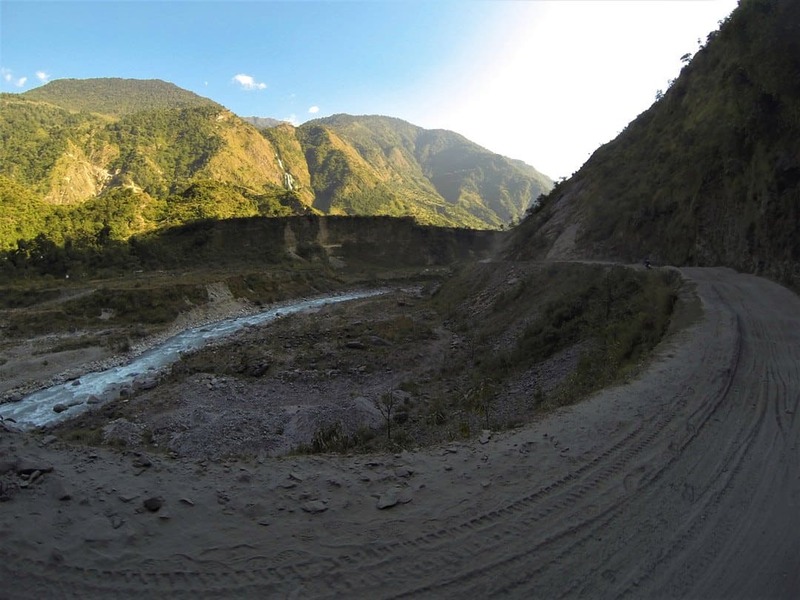 Driving through Beni saw roads slowly change with patches of sealed road becoming more frequent before slipping back to basketball sized rocks lodged into the middle of the road. Our driver for the first time in 6 hours managed to the get Rover into 3rd gear, and when he did we thought Pokhara would be under an hour away, only to discover to our disappointment that we were nowhere near our destination. To avoid our driver falling asleep behind the wheel a spare snickers bar was unwrapped for a sugar boost, followed by a quick hands-off wheel phone call to his friend back along the road. It was at this point 4th gear had been achieving maximum speed, probably 50 kilometres per hour. We certainly wouldn’t be arriving in Pokhara in the next hour and from here on in it was an orchestra of beeping car horns, blinding car lights and crazy over taking manoeuvres from our driver, who I had since named ‘James’. Dad and David in the middle seats were not looking impressed, neither was I. We just wanted to get to Pokhara. A random ‘Pokhara Internet Service’ sign appeared to our right falsely indicating how close we were to our destination. We still had 67 kilometres ahead of us and it was completely dark. An inbound truck pushing us very close to the biggest drop off I’ve ever seen. Pokhara became visible from Sera, perched on the mountains above Phewa Lake, only to realise it wasn’t a straight drive down the mountain; more like an endless zig-zagging away from the city leaving us back where we started in Jomsom. The lights on Phewa Lake waterfront seemed so far away and the only way there was by driving away from it, down the other side of a densely populated ridge, past pedestrians using the road as a vehicle-illuminated pathway which made for some very close calls, especially when you have vehicles coming your way and the road is wide enough for one car at a time. For the first time, I looked at my watch, 7:15pm. 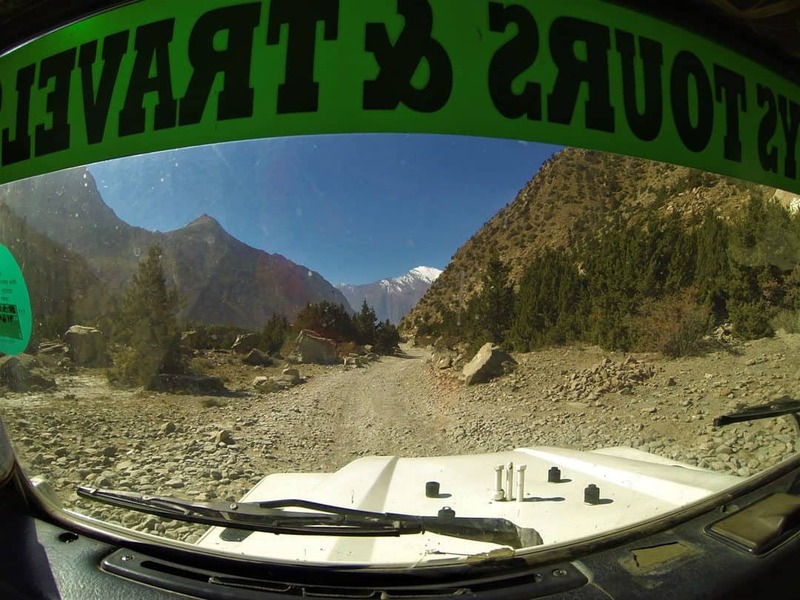 We had been in the Rover since 10:30am that morning in Jomsom, absolutely unaware what lay ahead of us. 7:30pm on the dot, fluorescent lights somewhat blinded us meant Pokhara had been reached. Conversation flew between the Nepalese couple and James the driver about where they wanted to be dropped off. Two minutes later, the Nepalese couple who paid David for the rear seats disembarked the Rover with a grin, and that was the last we saw of them. Honestly have no idea how they managed to sit or bounce in the rear and not get car sick (from what I am aware). Dhaulagiri, the 7th highest mountain in the world showing wind coming off the top. The reason why our flight got cancelled. James turns left onto Khahare Baidan and the language barrier proved to be a difficult task in where we wanted to go. “Anywhere in Pokhara will do!” screaming in my head. David just said, “White building, keep going,” and that was good enough. The rover was back to its usual speed of 17 kilometres per hour as we kept an eye on where we wanted to get out, and I was fine to get out 5 kilometres back and walk but suppose when you pay $450 USD for a taxi fare you want to be dropped off exactly at your destination. Then boom! 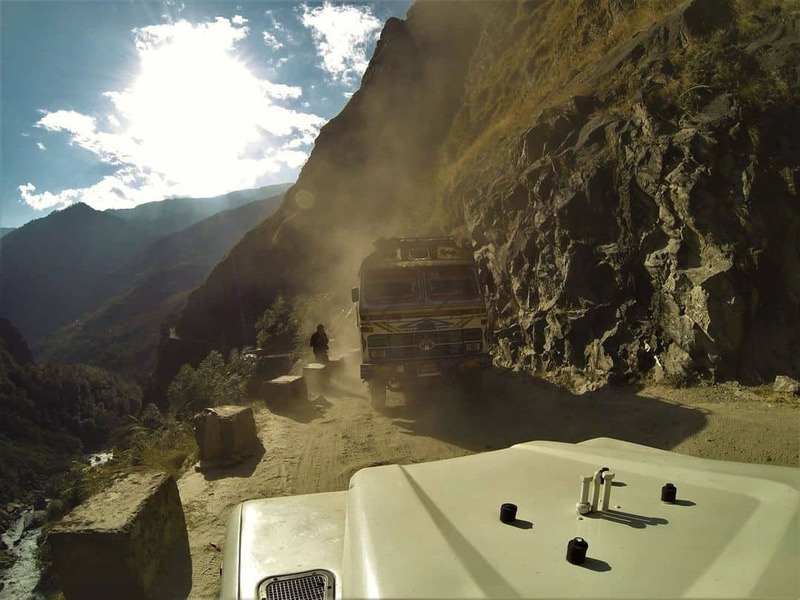 We arrived, creakily exited the Rover fearing our bones had been broken from the never-ending road of death, retrieving our dust coated bags from the back of the truck, wondering how much dust the Nepalese couple congregated. ‘Dhanyabad’ we thanked James for what was the most epic, expensive, closest we had come to a death-experience and off he drove leaving us clueless to what had just happened. Our camouflaged cabin interior and our driver who I named James. 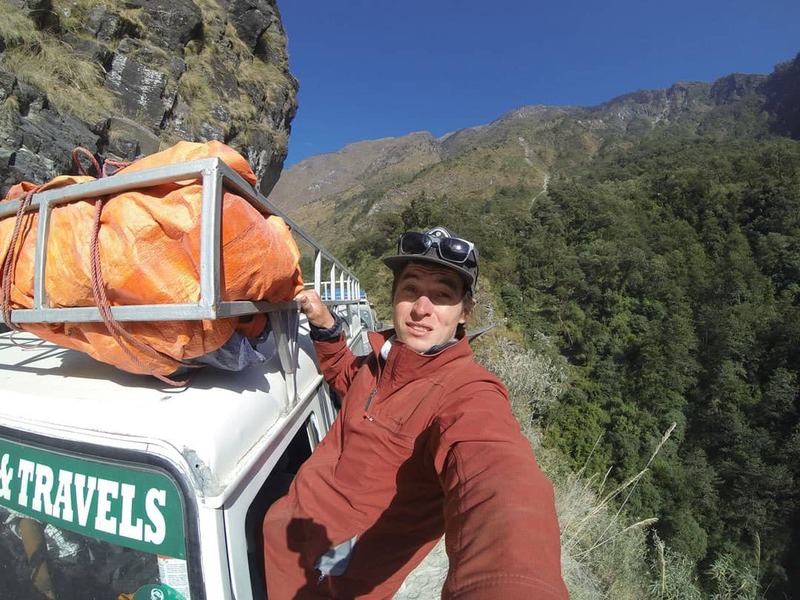 A relaxing 18 minute flight with views of the Annapurna’s, or 9 hours in a tin can on wheels with a hell of a story?